After the OV-10 thread (http://www.whatifmodelers.com/index.php/topic,11482.45.html) got side-tracked onto the never built CV-10 I thought I'd build the little van-thing. 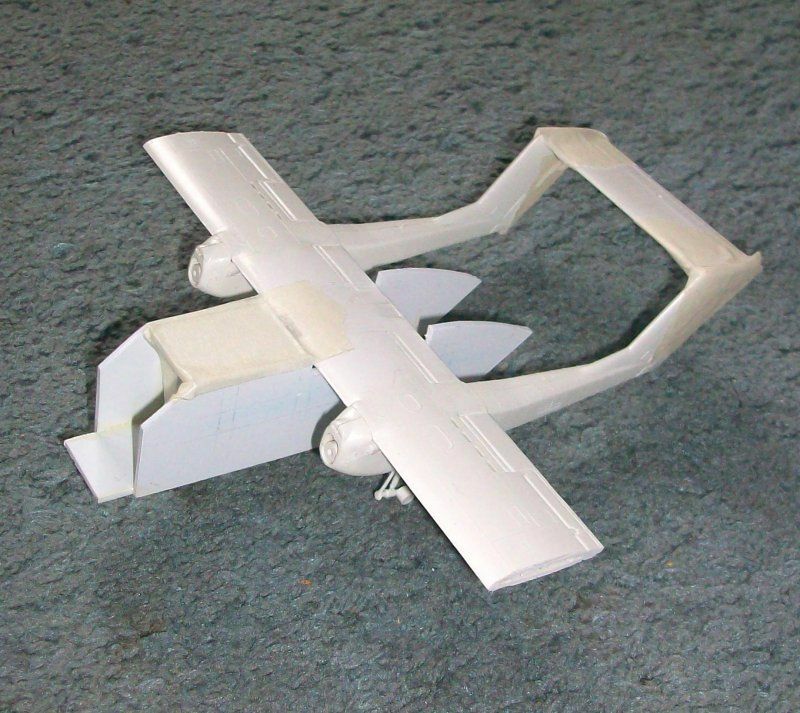 A couple of red herrings had me looking at Skyvans and Twin Otters but eventually I figured I'd scratchbuild the fuselage, it's a box with rounded corners after all. 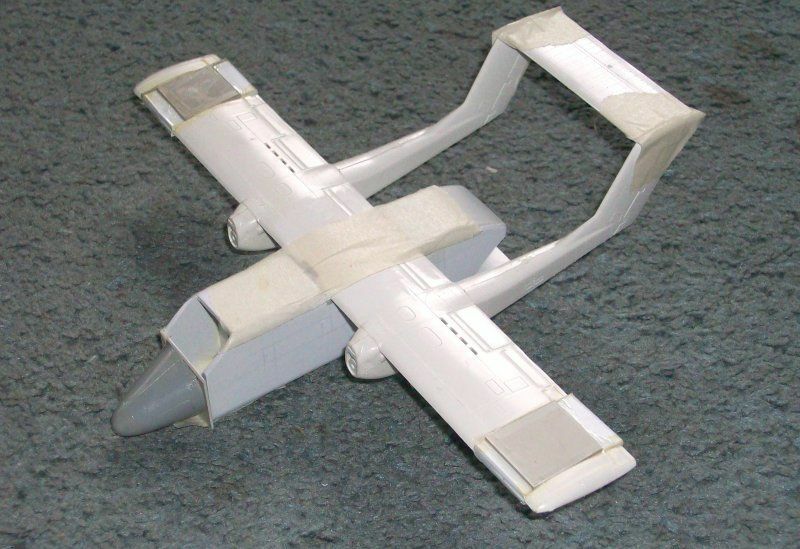 I used an Airfix OV-10 kit as a basis and the tape-up is shown below. I'm using the Flight Simulator model as a basis, which differs from the published plan a little, but as it's more detailed and as I can view it in any direction on my PC it makes the build a lot easier. Fuse;age box made from 1.2 mm styrene to give me scope for rounding the corners, and the wing-tips are already sawn off to add the 20 mm extensions. I haven't figured out which nose or windscreen to use so far, but it's early days yet. Sometimes, "boxey" can be cool. I like this, but I have a question Kit, wouldn't the wing center section have to be wider so that you had the same distance between the nacelles and fuselage sides ? or is there enough space? I asked myself the same question, and on my first run through the plans I thought the booms were further apart on the CV-10. However digging deeper, especially with the FS model, it looks as if they were planning to live with a reduced prop clearance, about 6" from the look of it! I specifically checked the prop clearance on the model tonight and it looks OK. The 'box' is now looking a bit more like a fuselage, and I'm trying to graft a Twin Otter long nose onto it, but it'll need lots of putty on the lower edges. It's pretty much OK in plan and elevation though. Also lengthened the wings with 20 mm plugs each side, so that'll mean a lot of re-scribing. The CV-10's starting to look more like an aircraft and less like a winged shed now. The Twotter nose has been filled with lead and trimmed to length, then backed with a profile plate before mucho putty is added to the lower edges and mid section to produce a more rounded shape. The wing extensions are fitted but need sanding to profile, and the 'shed' has been rounded off. I made a cod-up of the rear roof section so that had to be re-modelled and will need some putty engineering later. The ramp is built but once again will need shaping and puttying. I'm trying to work out a way to hinge it but it may end up with just a small length of tape underneath. How did I ever get any modeling done before I retired? Great Idea. I'm looking forward to seeing this one progress. M A G N I F I C O ! ! ! What does the windshield look like Kit? How about a Skyvan' ? That's a good idea, yes. I have a Skyvan in The Loft someplace, I put it there after rejecting its fuselage as a donor for the CV-10. I'm thinking maybe some GA stuff may work too, like a Cessna 182, 337 or similar. What a disaster that was, can't find ANYthing that really fits the bill. The best bet was an Airfix Hormone B chopper, but the angle is too steep and it has two socking great wipers in the middle of each panel. I'm less than happy about trying to take them off and repolishing it. It could be cutting out the side windows and moulding a new screen and windows with the old balsa block routine. Not done that for years now. If you use the Hormone canopy, why don't you leave the wipers on it. The RW OV-10 had a windshield wiper. In the ever-perverse Soviet fashion the wipers are not handed! They are both hinged on the starboard side, but midway to the edge of the screen and arc to port. I can't imagine anyone at North American ever doing anything so un-stylish. The FS model of the CV-10 has its wipers park tight up against the centre windscreen pillar and hinged from the base, which looks much more 'American' to me.